Billy Graham’s innocuous blend of showmanship and salvation. 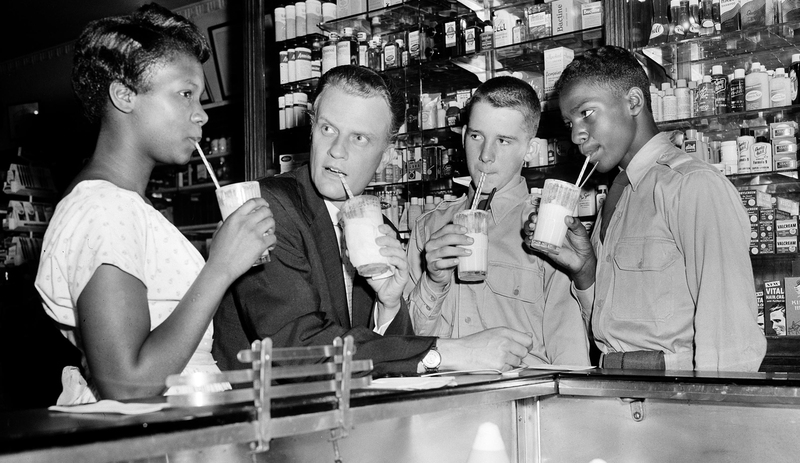 Billy Graham drinks an ice cream soda after discussing juvenile crime at a New York City news conference, August 8, 1957. Billy Graham and the Shaping of a Nation. A few decades later, the Methodist evangelist Lorenzo Dow—a mangy, long-haired character known for great faith but dubious personal hygiene—gained such popularity that his autobiography sold more copies than any book in America except the Bible. His name was second only to George Washington’s as parents’ top choice for their babies. Dow was an abolitionist, and later activist-preachers like Charles Finney and Henry Ward Beecher (whose fame landed him sponsorship deals with soap companies and watchmakers) also used their spiritual celebrity to champion earthly freedom for the slaves. These men (and a few women) worked in different theological traditions and stomping grounds, and in different eras, but they shared several common traits. All were masterful showmen who sometimes condemned worldly theater but understood its lessons. All stuck simply to the call to conversion and skimmed over niggling doctrinal details. All grasped the anxieties and opportunities of their age, and capitalized on both. Even if their exhortations to come to Jesus make you roll your eyes, they still deserve your attention: how these revivalists sold the Gospel to their time tells us something about the time itself. In our own era, the greatest celebrity evangelist of all is Billy Graham. He is 96 and has been mostly retired for almost a decade, but in his heyday he displayed all the soul-winning showmanship of Whitefield. History also offered him the political opportunities of Dow, Finney and Beecher. Graham achieved international fame during the 1950s and ’60s—a time, like the polarizing age a century earlier, when no Christian could avoid taking some kind of stand on race and social revolution. For many decades, scholars and journalists have scrutinized Graham’s every statement and appearance, and they continue to press him harder than anyone ever grilled his predecessors. Perhaps this is because of the sheer scale and duration of his fame: during his sixty years of full-time evangelism, 215 million people heard him preach in person, and another 2 billion tuned in to telecasts. His radio (and later television) show Hour of Decision reached 20 million homes in the 1950s. His many books sold millions of copies. A 1978 survey of notable “achievements in religion” in Ladies’ Home Journal ranked him ahead of everyone except God. The central decades of Graham’s career coincided with the rise of the United States as a Cold War superpower abroad, the hard-won defeat of Jim Crow at home, and the emergence of evangelical Protestantism as a national force in American politics. If the mega-revivalist is often a window onto his age, then perhaps Graham’s popular appeal and political gestures can help explain a time when priests and pols dueled with prophets, when Christianity seemed to sanctify structures of power and injustice while also gnawing at their foundations. The historian Grant Wacker has spent the better part of his career observing the battle over Graham’s legacy. His biography America’s Pastor is an exhaustive and judicious effort to settle this cultural obsession with Graham and assess his influence. Other scholars have written doorstop-size narrative accounts of Graham’s life, tracing events from his childhood on a North Carolina dairy farm through his massive revival campaigns and frequent visits to the White House. Wacker has produced a different kind of book. He has, it appears, read every work of scholarship about Graham, from the mightiest bestseller to the lowliest unpublished doctoral thesis. He has combed through a mountain of archival sources. The result is not a conventional biography, but a series of interpretive essays that evaluate Graham’s various roles in twentieth-century America, from “Preacher” and “Entrepreneur” to “Southerner” and evangelical “Patriarch.” The result is the most comprehensive and balanced analysis of Billy Graham ever published. Wacker makes a convincing case that Graham was indeed an icon of his age—but he was hardly a crusader who changed history. Graham was born in 1918 near Charlotte, North Carolina, to a pious, middle-class farming family. At age 15, he wandered into a local tent revival and resolved to commit his life to Christ. After bouncing between fundamentalist Christian colleges in the South and the Midwest, he emerged in the 1940s as a popular evangelist with the wartime ministry Youth for Christ. In 1945, he crisscrossed the country to preach to veterans and young people, logging more miles on United Airlines than any other civilian passenger. Soon he broke off to preach on his own. A hundred thousand people attended the final night of his 1949 revival in Los Angeles. Yet his fame only grew. Wacker identifies several reasons for his success: a savvy adaptation of his ministry to radio and television, not to mention a vast print media empire; a carefully massaged image that presented Graham as the epitome of manly yet anodyne Southern charm. At a time when news reports were full of bellowing thugs like “Bull” Connor and Orval Faubus, Graham impressed people as “the Cary Grant of the evangelical world,” a handsome, moderate and respectable white Southerner whom any nice Yankee girl could bring home to meet her mother (of course, he was quite content in his storybook marriage to Ruth, a missionary’s daughter and mother of his five children). Wacker masterfully anatomizes Graham’s public image, his good manners and clever sound bites that proved to American elites that evangelicals could be respectable, and proved to evangelicals that being evangelical could be “less a theological position than a style, a way of behaving.” Journalists loved him, and every US president from Eisenhower to George W. Bush enjoyed his company, or found it politically necessary, or both. His presence in a photo op meant a potent imprimatur, and he had an instinct for the worries and wants of the middle-American folks who packed his revivals. But as agitation for civil rights blossomed into a mass movement—and especially when King began speaking out against the Vietnam War—Graham’s relationship with the civil-rights leader cooled. In 1963, he told King to “put the brakes on a little bit,” and he steered clear of the March on Washington. While he did endorse President Johnson’s civil-rights agenda, Graham tried to avoid controversy when it threatened to distract anyone from the call to be born again (never mind that the vast majority of his audiences were already church members: reaffirmation of faith is just as important to evangelicals as brand-new conversion). He loathed confrontation, and occasionally his “pacific instincts seemed to slip into faintheartedness,” Wacker writes. The overall impression is of a white middle-class man who—like most white middle-class people—never really grasped what black Americans were up against. Depending on how you look at it, this was either a failure of compassion or a mark of cultural savvy: Graham knew exactly how far he could prod conservative white Americans without making them so uncomfortable that they might run him out of the pulpit. This is a provocative comparison. In some regards, Wacker is onto something: all three men understood how to deploy the Gospel message for wide appeal, and all maintained a careful public distance from radicals within their own movements. All three epitomize charismatic leadership, and their careers demonstrate how one individual can come to represent—to followers and critics alike—the worldview of millions. But ultimately the analogy may obscure more than it clarifies, and mistake airtime for influence. King and John Paul II were prophets who operated largely outside the centers of power; who risked their own safety to speak truths that policy-makers in America and in the Communist bloc did not want to hear; and who inspired oppressed people to organize and demand change. Graham did none of these things. He was a priest, not a prophet. He blessed the policies of his pals in the White House. His naïveté and respect for authority blinded him to Richard Nixon’s criminality, not to mention the barbarities of Vietnam: “We have all had our Mylais in one way or another, perhaps not with guns, but we have hurt others with a thoughtless word, an arrogant act or selfish deed,” he intoned in 1971. Graham’s critics complained that he soothed white Americans with the narcotic of “cheap grace,” a dose of smug contentment that demanded no real sacrifice. It’s true that Graham began desegregating his crusades and cautiously supporting civil rights many years before most of his Southern constituents were ready to relinquish Jim Crow. In Wacker’s measured appraisal, “he did not always lead the way as boldly as he might have done, even by his own lights, but he was rarely very far behind the movement’s shock troops, and far ahead of the great majority of his constituents.” But whether Graham’s example ultimately swayed resistant white evangelicals—as Wacker suggests but does not quite demonstrate—is a more difficult question. It is not at all obvious that Graham, like King and John Paul II, “saw the world clearly and tried to change it dramatically,” or that he joined them in setting “in motion forces that came to fruition long after their careers had ended.” King and John Paul II possessed an expansive moral vision that allowed them to see that people’s demand for dignity was stronger than the institutions that bound them. Graham, on the other hand, had a rather average moral imagination. In other words, Graham was a typical American evangelist. Celebrity preachers who become visionary social reformers always have been the exception to the rule. Most evangelists and missionaries are pragmatists: they worry more about the hereafter than the here and now, and they know better than to challenge social conventions too forcefully. The true place to assess Graham’s influence is not the national political scene but the American evangelical subculture. Wacker argues that Graham, more than any other single leader, defined the internal dynamics of American evangelical culture and belief. At a time when evangelicals were recovering from decades of nasty schisms and doctrinal debates, when they were beginning to engage mainstream society with new gusto, “Graham’s presence constituted the electromagnetic center of the post-war evangelical movement. His voice settled discussions,” he writes. My own research has persuaded me that Graham’s ministry indeed became one of evangelicalism’s internal touchstones, but he rarely settled debates. Rather, his ubiquitous image in the press and his efforts to organize fellow evangelicals under the banner of his media empire and international conferences sharpened the divisions between the culture-warrior Calvinists and peacenik Mennonites, progressive social gospelers and heresy-hunting fundamentalists. Some liked Graham. Others loathed him. Either way, they defined themselves in relation to him, like insecure adolescents aping or defying a cool older brother. In this regard, Wacker rightly credits Graham with refining “American evangelical boilerplate,” “the intellectual benchmark that enabled evangelicals to define the boundaries of orthodoxy.” But perhaps that should be “orthodoxies” in the plural: Graham was never the “pope of Protestant America,” as Time magazine once called him (the magazine put him on the cover at least six times). What appeared to the mainstream media to be a monolithic subculture—for which Graham was convenient shorthand, a “fixed point of reference”—was, and remains, deeply divided against itself. Graham understood these divisions. He knew that his authority and appeal depended on remaining, as much as possible, above the theological and political fray. The Watergate scandal taught him the costs of allying too closely with any politician, and as the Christian right gained momentum he hung back from the front lines of the culture wars. In 2011, he told Christianity Today that he wished he had “steered clear of politics.” The following year his son Franklin, who now runs the Billy Graham Evangelistic Association, promoted Sarah Palin on the organization’s web page and ran national newspaper ads implying that Billy Graham endorsed Mitt Romney. Progressive evangelicals were outraged at this attempt to pass off Republican propaganda under the blessing of his sainted father, whose health was too poor to permit him to speak for himself.